Quick: What are the biggest drawbacks to riding transit? Buses getting stuck in traffic? Having no idea when the next bus or train will come? Too many transfers? The folks at Boston’s Massachusetts Bay Transit Authority have zeroed in on a more pernicious threat: kids in strollers. 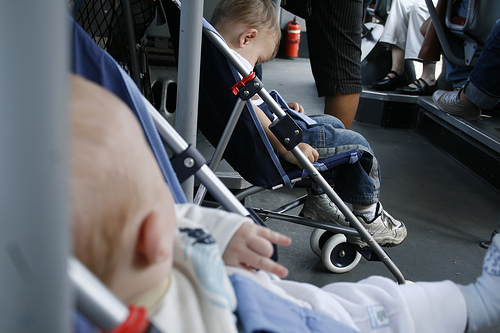 Turns out, people hate strollers. The MBTA’s general manager, Richard Davey, recently told a Boston Herald reporter, “The number-one complaint that I have received since I have been here is strollers.” As such, the MBTA is considering a rule that would require parents to fold up strollers on buses, and potentially trains. It is unrealistic to expect parents to always fold strollers, particularly on the subway. On a crowded bus, I can understand a driver asking a passenger to fold a stroller in order to accommodate more passengers getting on (which drivers currently do). Some other cities do have this requirement. But it can be extremely difficult for parents, especially those of us with multiple children, to juggle an infant or toddler, a backpack or bag, and an older child along with a folded stroller. It would certainly be disruptive to other passengers (toddlers who are strapped in are much easier to deal with), require much more time for boarding and exiting, and be potentially dangerous if seats were not available (although I have found that passengers will almost always offer me a seat if I have children with me). The fact of the matter is that what is really inconvenient and annoying is having children on trains and buses at all. They are noisy, come with too much gear, pick their noses openly, and smell bad. It would be easier and more pleasant for many if children were simply banned from public transportation. Or better yet, from public. But sorry folks, I’m a parent and I have a need to ride on trains and buses with my kids, so I’m going to keep bringing them with me. And it’s better for all of us for me not to buy an SUV. Many thanks to the vast majority of you who smile at my kids when they are cute and tolerate them when they are not. If you want to be a voice in support of having family-friendly transit, let the MBTA general manager know that even if a stroller ban may be popular, it’s not OK to throw parents under the bus. Vierling-Claassens is encouraging Boston-area transit riders to log comments with the transit authority in support of stroller-toting parents. Elsewhere on the Network today: Human Transit and Portland Afoot have some serious questions about the methodology used in US News and World Report’s “10 Best Cities for Transit” list. Greater Greater Washington pays tribute to Amtrak on its 40th anniversary. And The Overhead Wire comments on the agonizingly slow build-out of the Twin Cities’ rail transit plan, pointing out the need for a program like America Fast Forward, the national version of Los Angeles’s 30/10 accelerated transit financing strategy.